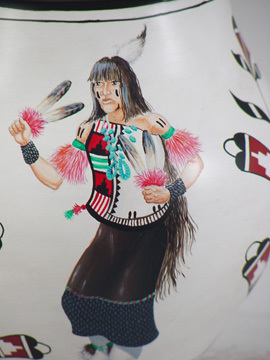 This is an authentic hand made, and hand painted bowl by Marcellus and Elizabeth Medina arguably two of the most famous potters to have come from the Zia pueblo. 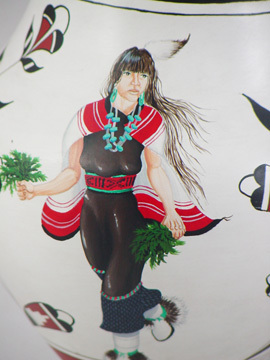 Marcellus is the son of Rafael Medina and of Sofia Medina, the still active famous matriarch of pueblo pottery from Zia. 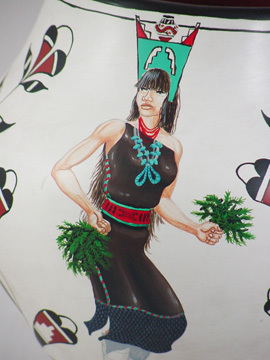 Rafael Medina initiated the use of acrylic paint on pueblo pottery, and today the pots that he decorated with this method are among the most sought after pueblo pottery. 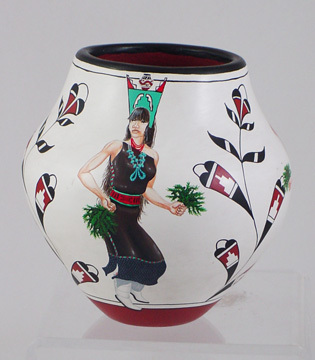 Marcellus and Elizabeth have won numerous awards and are featured prominently in Fourteen Families of Pueblo Pottery. 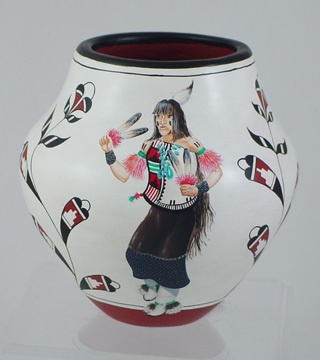 Marcellus has become famous for his use of acrylic paint and the absolutely exquisite renditions of his figures on the pot. Along with his wife, Elizabeth, they produce absolute works of art. Marcellus Medina is also a painter in his own right as is attested by the fact that he was commissioned to paint a mural in one of the Pueblos. All the elements to construct this wonderful piece were provided by Mother Earth. 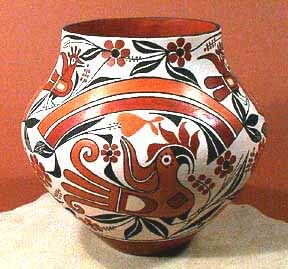 The clay was hand-gathered and hand-coiled into the olla, and fired over open ground (not in a kiln). As Marcellus says in Fourteen Families, he likes to make pots of the size of the present one. 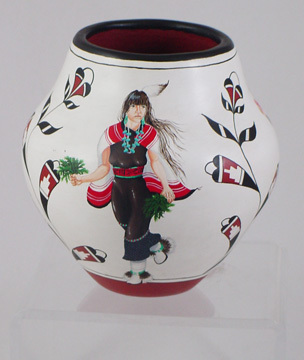 This pot measures 6.00 inches in diameter and 5.5 inches in height and is a magnificent example of the artistic prowess of its creators. The white slip possesses a near perfect smoothness and the painting of the two figures is superb.